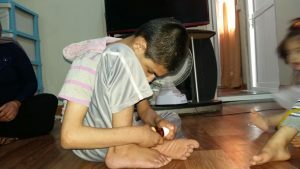 Zazar is 14 years old and he has been presenting symptoms of mental retardation, epilepsy and cerebral palsy since he was a 3 years old little boy. 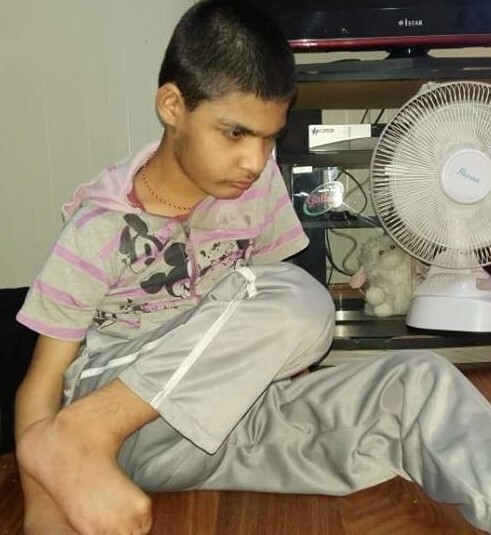 To date, he is not responsive at all, he can’t walk nor eat by himself and he can be extremely hard to control during his frequent epileptic attacks. Amir is his brother and he is just 4 years old. Since last year he has started to present similar symptoms to Zazar. Additionally, Miranda, their 1 year old sister, is now also presenting some mental deficits. The three of them are currently living in two small tents in Darkar IDPs camp with their other 6 siblings and parents. They moved to the camp after walking all the way from their village in the south of Sinjar District through the mountains in order to escape ISIS and finally reach safety in Kurdistan. Their forced migration was especially challenging considering they had to somehow transport Zazar and their mother was also pregnant of Amir at that time. 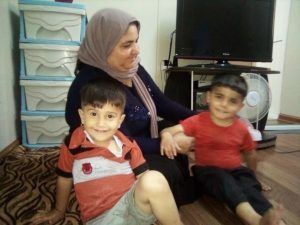 Since displacement, Babir, their father, has struggled to find employment. In fact, thousands of IDPs moved to Kurdistan and employment opportunities are not enough. Furthermore, Babir was recently involved in a car accident and so now is definitely not able to work. The family is not only without any income, but is also socially isolated because of their hectic domestic situation. With our staff we arranged a visit for all three kids with a specialized neurologist who prescribed new analyses and different new medications. Soon we will have the results of the MRIs and we will try to arrange targeted treatment and long-term support so that they won’t have to keep living in this tragic situation. We hope that with your donations we will be able to help this family slowly regain control over their everyday life and build a brighter tomorrow.